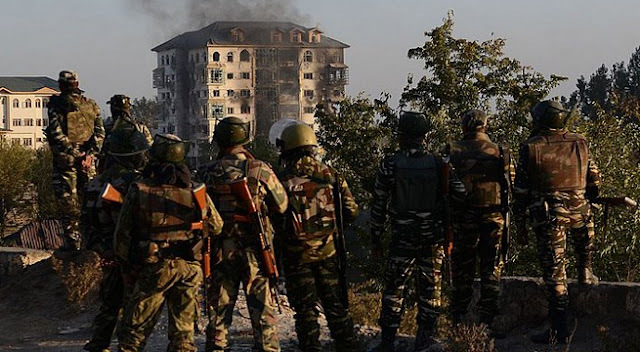 Gun-battle of over 50 hours with terrorists who barged into a government institute in Jammu and Kashmir’s Pampore on Monday, the army today said two of the terrorists are dead and forces have entered the seven-storey building in the town around 15 km from Srinagar. One terrorist was killed yesterday and another was shot dead today. Forces are now searching for a possible third terrorist still hiding inside the battered Entrepreneurship Development Institute (EDI) building, where young Kashmiris are given vocational training but classes are currently suspended. Over 50 rockets, machine guns and hundreds of grenades have been used against the terrorists. Loud shelling could be heard on Wednesday, even 10 km away. A soldier was injured in the initial firing after the terrorists entered the building in saffron-rich Pampore on Monday evening. Since then, the army has brought in special forces from the same unit that had carried out surgical strikes in Pakistan last month (the information being shared here is delayed so as not to jeopardize the security forces fighting the terrorists). Officials said the encounter has stretched on because the building offers a “bunker-like” protection. The terrorists are seemingly well-stocked in ammunition and supplies and prepped for a prolonged operation, which makes it a tough challenge for the forces. Despite the building catching fire several times, the terrorists have not come out. Classes have not been held for more than three months in the institute because of the unrest in the state that began with the killing of 22-year-old terrorist Burhan Wani in July. The same institute had been targeted in a major attack in February. Five soldiers and a civilian were killed then; three terrorists were shot dead. Sources said that terrorists approached the campus through boats on the River Jhelum, which flows from Kashmir into Pakistan. According to the police, the terrorists set sections of the building on fire to lure security forces. When they arrived, a major gunbattle broke out. Intel agencies have been warning of terror attacks in retaliation for the surgical strikes conducted by India across the Line of Control two weeks ago. Soldiers raided staging areas in Pakistan-occupied Kashmir where terrorists were waiting to cross the border and attack major cities, the army has said.